A few weeks ago I wrote a blog where I talked about how we customize not only our product for our clients but how we also customize the experience for them. This applies also to our newest app that we launched with Flaman. We began talking with their marketing department in the fall of 2012 and since that initial conversation their app has evolved to the great product that is available on the iTunes store and Google Play today. Flaman has a great internal marketing team that is made of some very talented individuals, one of which took our CEO’s Smartphone Programming class at the University of Saskatchewan. Flaman was interested in getting him in our office every few weeks to help out with the development of the app and to learn from our developers. This turned out to be a great process for not only Flaman, but for us as well, as we had someone from their internal team to ask questions and consult with on the project. This partnership between our two teams allowed us to develop a great end product and gave our developers the chance to mentor and see how other teams operate. 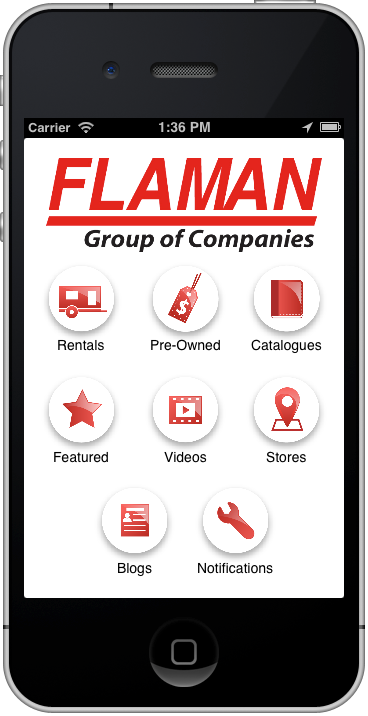 The free Flaman app is all you need to find the agricultural equipment or trailer you’re looking for. Quickly and easily find your local rental dealer and see what equipment they carry. Never miss out on a great deal again! Get instant access to our pre-owned and clearance equipment and trailer inventory. Check out the pictures, specs and prices. 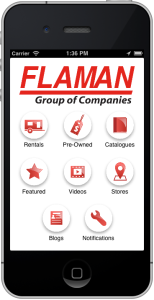 Contact Flaman right from your phone when you find what you need. Want even more information? Get alerts when there are new catalogues, blogs and videos posted, so you’ll never miss anything.